Aniridia is the complete or partial absence of the iris. Affected patients suffer from severe glare. The patient’s own external appearance can be a source of distress. The CUSTOMFLEX® ARTIFICIALIRIS is a medical implant that is inserted into the eye as a replacement for the defective iris. The CUSTOMFLEX® ARTIFICIALIRIS is custom manufactured for each individual patient and is precisely modeled on the appearance of the natural iris. 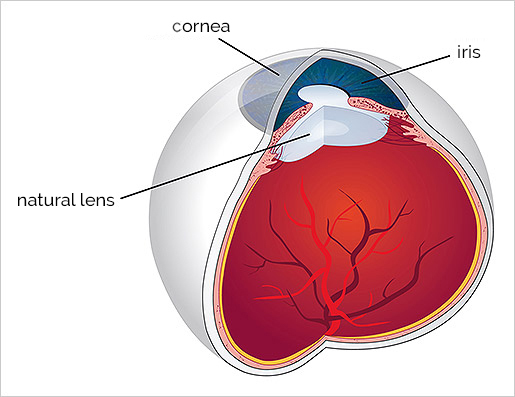 The natural aperture function of the eye is restored and the quality of vision improves considerably. In most cases, the eye with the implant can hardly be distinguished from the healthy eye. CUSTOMFLEX® ARTIFICIALIRIS is only available for operations in connection with medical indications, not for applications for the sole purpose of color change. What is aniridia and what are the consequences for those affected? In your leisure time or at work – there are many ways to injure your eyes in everyday life. Gardening accidents caused by sharp objects or in the household by corrosive chemicals are only a few of many causes of more than 300,000 eye injuries a year. If the natural iris is damaged partially or is missing completely, it is referred to as aniridia. Apart from acquired iris defects, aniridia can also be congenital. 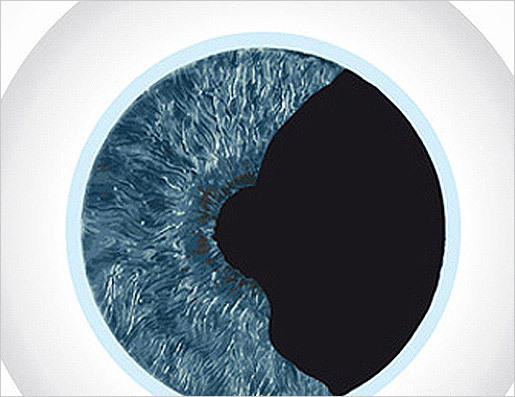 The defective iris severely impairs patients’ vision because the natural iris is missing. In the healthy eye, the iris controls the incidence of light by adjusting the pupil diameter to the light conditions: the brighter it is, the tighter the pupil contracts. In this way, contrasts between light and dark objects in the room can be easily perceived. Like a camera, the pupil also affects the depth of field, the area in which objects near and a little farther away are seen sharply at the same time. If the iris is missing, light can enter the eye almost unhindered. Patients affected by the condition perceive strong glare even in normal daylight and are very sensitive to light. In addition, contrasts are less noticeable and depth of field is reduced. A defective iris is also a cosmetic impairment that can negatively affect the personal appearance as well as their quality of life. Other people may be disturbed by a deformed or missing iris. What treatment options are available for aniridia? The disturbing glare caused by an iris defect can be temporarily minimized with sunglasses or contact lenses. In aniridia, however, the treatment of the eye with a medical implant is often the only adequate option. In a short surgical procedure, the defective iris is reconstructed with the help of an iris implant that restores the natural aperture function to the eye, but the pupil size always remains the same. With CUSTOMFLEX® ARTIFICIALIRIS, HumanOptics offers a globally unique standard in the treatment of iris defects. 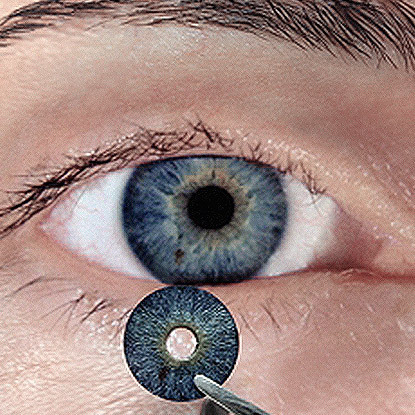 The foldable implant restores both visual functionality and the aesthetic appearance of the iris. Although conventional iris implants are a functional solution, they largely ignore the patients’ personal appearance. Often, they are only available in a limited selection of standard colors and the tissue structure is poorly imitated. If these implants are made of rigid materials, such as plexiglas-like materials, they require relatively large incisions during implantation. The larger the incision, the higher the risk of infection and astigmatism. What is special about the CUSTOMFLEX® ARTIFICIALIRIS from HumanOptics? With the CUSTOMFLEX® ARTIFICIALIRIS, HumanOptics has created a solution that finally gives those affected by aniridia hope of an improvement in quality of life. 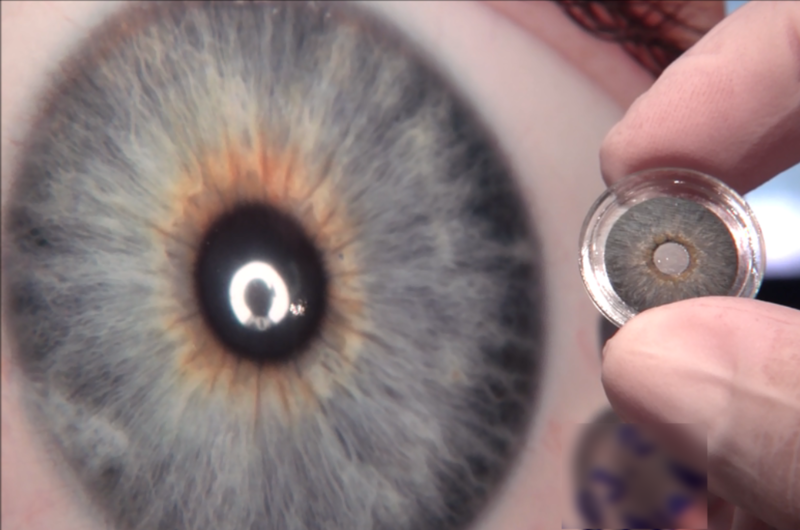 The CUSTOMFLEX® ARTIFICIALIRIS from HumanOptics is a globally unique and medically recognized implant that restores the eye both medically and aesthetically. The color of the CUSTOMFLEX® ARTIFICIALIRIS is individually adapted to the original iris of the patient and is manufactured by hand in Germany. A photo of the intact iris serves as the basis for the color design of the iris implant. Even the finest color nuances of the iris are individually considered – this is the only way to achieve a natural appearance. The eye treated with CUSTOMFLEX® ARTIFICIALIRIS can scarcely be distinguished from a healthy eye. Our iris implant, made of high-quality medical silicone, is foldable and can be implanted in a minimally invasive procedure. The risk of infection is minimized by the small incision technique, which accelerates the healing process. With CUSTOMFLEX® ARTIFICIALIRIS, the patient benefits from significantly reduced glare sensitivity, improved depth of field, and optimized contrast vision. Through the aesthetic reconstruction, the appearance of the eye is also restored and the patient can fully participate in social life without a social handicap. For affected patients eligible for this procedure, color photos are taken of the defective residual iris and the existing healthy iris of the second eye. The experts at HumanOptics use these templates to precisely transfer the color pattern to the implant. If no iris is present at all, the eye color can be designed according to a freely chosen photo of any iris – that of a relative, for instance. The insertion of the CUSTOMFLEX® ARTIFICIALIRIS usually is performed under local or general anesthesia. The rolled-up silicone disc is inserted through an approximately 3 mm incision at the edge of the cornea, and then unfolded and fixed in the eye. 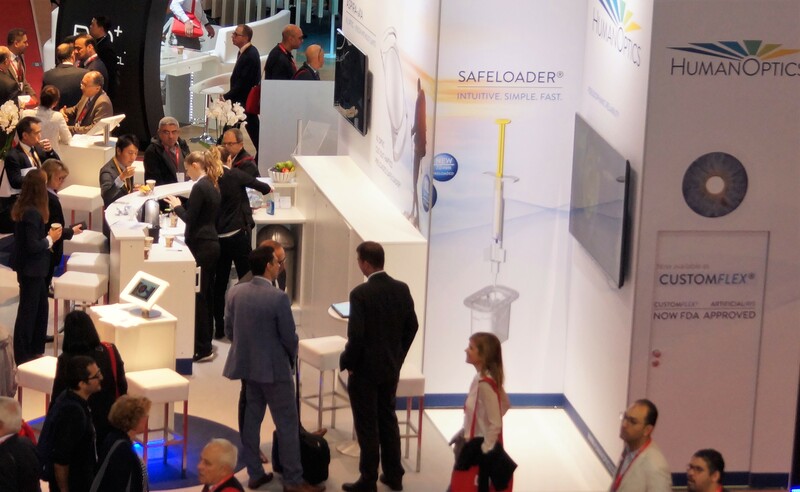 As soon as the protective dressing is removed from the eye after the operation, the treatment result is visible and the new iris can assume its light-limiting function. With the defined pupil size, the iris implant offers a good compromise between day and night vision. The sensitivity to light is greatly reduced and depth of field is improved. Contrasts and color nuances become more pronounced. Is the treatment covered by health insurance? Payment of the implant and treatment costs must be agreed with your health insurance provider. Your ophthalmologist can request a cost estimate from us for your health insurance company. What do the experts say about CUSTOMFLEX® ARTIFICIALIRIS?